On the morning of December 2nd, I had a major health scare. I was getting up to get ready for work and on the way down the stairs, I suddenly felt like gravity had shifted to my right side. I was struggling to open the door and navigate around the pets but struggled to walk straight. I went to the sink to wash my face, but the dramatic loss of coordination I was experiencing made it that I could do little more than slap water at myself. I knew something was wrong, and tried to get Shari’s attention – she asked me what was wrong and I couldn’t complete my sentences. I was dizzy and felt like I was about to black out, so I sat down thinking maybe I was having a narcoleptic moment and Shari got me some juice in case it was blood sugar. After a minute or two, I felt better and went to get into the shower. I had just gotten in when the dizziness, weakness, loss of coordination and speech impairment started again, but it was worse this time. I was stuttering, unable to tell Shari what was going on – she said that she could see the fright in my eyes as I struggled to understand what was happening. But I knew it was something serious and thought I was having a stroke. Turns out I kind of was. At Cooper Hospital, a CAT scan revealed that I had a distal basilar thrombosis, resulting from a 25% occlusion of the basilar artery – the main artery that feeds most of the blood supply to the brain. And which feeds the smaller arteries that supply blood to most of the autonomic and higher functions of the brain, including breathing, motor control, speech, etc. The Chief of the ER immediately told Shari that I needed to be transferred to Jefferson, one of the few hospitals that was able to do what was the only procedure to deal with the situation. I was taken by ambulance from Cooper to Jefferson Neurological Hospital (JNH) for evaluation and (probable) emergency surgery. However, when I arrived the entire team was amazed to find out that I was fully conscious and had no apparent mental deficits. According to the neurosurgeon (woo-hoo, I have a neurosurgeon! ), the majority of patients she sees with this are severely impaired or brain-dead, and she told Shari that my situation was extremely rare – and precarious. To be honest, she wasn’t sure why I wasn’t much worse off than I was, so I’m extremely lucky. Still, they went and did a number of additional tests (another CAT scan, 2 MRIs) and started me immediately on heparin to ensure another episode didn’t finish the job. 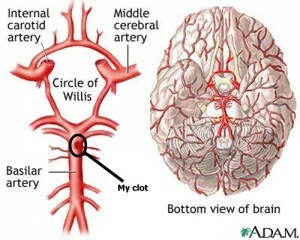 In the meantime, the new tests confirmed the diagnosis, though Dr. Stav was still unable to explain my good condition – my age and physical condition have something to do with it, but the biggest factor seems to be that the other arteries in the Circle of Willis (a series of arteries just above the distal basilar artery) stepped in to compensate almost immediately. Unfortunately, the surgery was no longer an option – the viable period had passed and with my current state of mind (i.e. no mental deficits) the risk wasn’t worth it. But I wasn’t out of the woods yet – in fact, there was still a high risk of another event that could be even worse. And so I was admitted to Neuro ICU for the critical first 24 hours. At this point, Shari had had to make the phone calls that no one wants to make, calling family to tell them they needed to get to the hospital. Dr. Stav had been very frank about my chances – according to Medscape.com only about 20% of people who have this condition survive – and she had to deal with that and contacting people. Luckily my mother-in-law was there from Cooper Hospital on to help support her. As for me, I was scared shitless. After seeing the Medscape information, I realized that this wasn’t a simple TIA and the doctors seemed to be confirming this (I would find out later that all involved were afraid that things could turn for the worse at any time, thinking my current condition was only temporary). Other than the first symptoms I’ve suffered no discernable effects other than shell shock and the lingering fear that it was only a matter of time until another, fatal incident would occur. That night may have been one of the most harrowing I’ve ever had as alarms and buzzers went off constantly, each bringing a little pang of fear. I saw others going by that were in obvious critical condition, driving home the seriousness of my condition if I was among them. I got almost no sleep despite the effects of compazine, which they gave me for a migraine that was triggered by the event. When I woke up the next morning – still a little groggy from the medications the day before – I texted Shari. She said it was the greatest text she’d ever received, and I have to say that it was a great feeling to be able to send it. From the beginning of the day I was subjected to a number of doctors, nurses and techs who were there to check my every vital sign, do a number of mental acuity tests and ensure my continued good status. 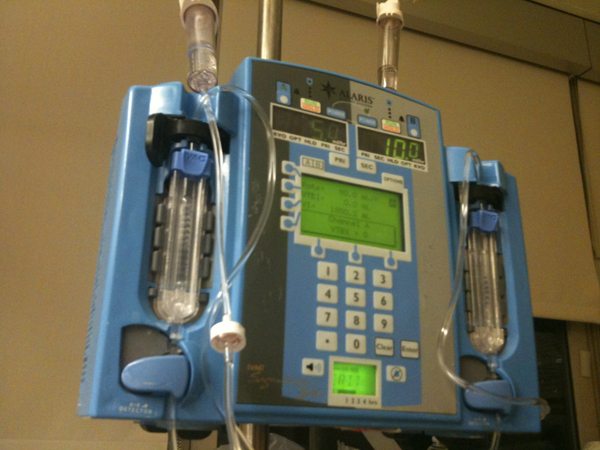 I had tubes and wires everywhere – 1 IV for the saline, another for the heparin, an arterial line (VERY painful) to keep second-to-second tabs on my blood pressure, EKG and breathing leads, Pulsox monitor … all which tied me down pretty well. Strangely, I felt fine – tired and scared but fine. Several more tests were done – another MRI and several echoes including a “bubble echo” of my heart which showed evidence of a very small hole in my heart (a patent foramen ovale), which they think may have been the pathway that contributed to my TIA. But other tests were less conclusive as to the cause. I gave vial after vial of blood, was poked and prodded, tested and quizzed; I was flooded with bag after bag of saline to keep my blood pressure up. Relatives started arriving to see me, and I could see the fear in their eyes too. It was weird to feel as well as I did in the face of what was obvious concern and negative prognosis. My parents rushed home from Georgia, my sister and brother-in-law cut short their vacation in San Francisco, my local relatives arrived en force. Obviously things were serious – more so, perhaps, than I had let myself believe. For the next four days, I would be monitored and tested although I felt fine. The support of family and friends was amazing – both th0se who visited and those who contacted me by phone or online. I didn’t want to say anything to anyone – particularly Facebook – because it seemed like pandering for sympathy. But Shari had used Facebook to contact family initially and that had spread to others knowing that something had happened, but not what. Several people contacted me trying to figure out what was going on and if I was okay. It felt like a bit of a sham – I felt fine, but I also knew there was a potential time bomb that could turn serious at any time. In fact, once or twice, twinges of dizziness started a minor panic in me – but they never amounted to anything other than my own anxiety. However, the worst thing for me was the constantly being wired up, blood draws and the inconvenience of going to the bathroom. Oh, and the food. The food at the hospital wasn’t really bad – in fact, it was better than I had expected – but it seemed like nearly everything was covered in gravy. Of course, I wasn’t really very hungry so it wasn’t a problem, especially coupled with the food that my family kept bringing — cannoli from Termini Brothers, muffins from Wegman’s and more. One major positive: I have to say that the staff at the hospital were amazing – I’ve never stayed in a hospital before but they were always around when needed, were extremely helpful and always willing to answer any questions we had – or get answers. They were a special breed of nurses – from the neuro emergency team to the ICU staff – and were a critical element of my recovery. I can’t explain how much they meant to Shari and I during my ‘stay’. Meanwhile, I was stuck in ICU with a bunch of books and my iPhone and bad TV to keep me company when family wasn’t around. That, and “Artoo” who went off at odd times to keep me company. I was supposed to be moved out of the Neuro ICU 2 days previous but was delayed because the (1) there were no beds in the intermediate unit and (2) a migraine scare (which resulted in another CAT scan just to be sure). Finally, on Day 7 I was released to the step-down ICU unit. Bad news – I lost my private one-person room; good news – I was that much closer to going home. The only impediment was my INR levels of coumadin – I needed a therapeutic level of between 2 and 3 for me to get released. Unfortunately, my INR level on Tuesday was well short of the needed level – which meant that I was going to spend my birthday (my 40th) in the hospital. I have to admit, it was a pretty miserable experience. Of all the places I wanted to be, and things I wanted to do, on that day being in the hospital was just about the last one (of course, being dead was still further down the list). In the end, I decided that I just didn’t want to remember my 40th being at the hospital and downplayed it, although I was really grateful that Shari still came by (as did my parents). It was a small bright light in a pretty self-indulgently miserable day. I felt fine, I just couldn’t get the hell out of there. I had to tolerate a pair of ‘roommates’ that made it difficult to sleep, which added to my intolerance of being cooped up in the hospital. I was ready to go, especially since I felt fine – it was that damned coumadin level that was holding me there. Finally, Friday morning I got the good news – my INR was 2.1, good enough to get out of the hospital. After a semi-hellacious wait, I was finally discharged about 1 p.m. and let back outside. It felt so good to be up and out of the room, to breathe fresh air and to be unattached from IV lines and monitors. It was a great feeling, but one that paled next to the ability to take a shower for the first time in nine days – I pushed our hot water heater’s volume to the max as I washed myself of the dirt, the grime, the hospital all at once. And then I slept. Now I have to get on with my life. 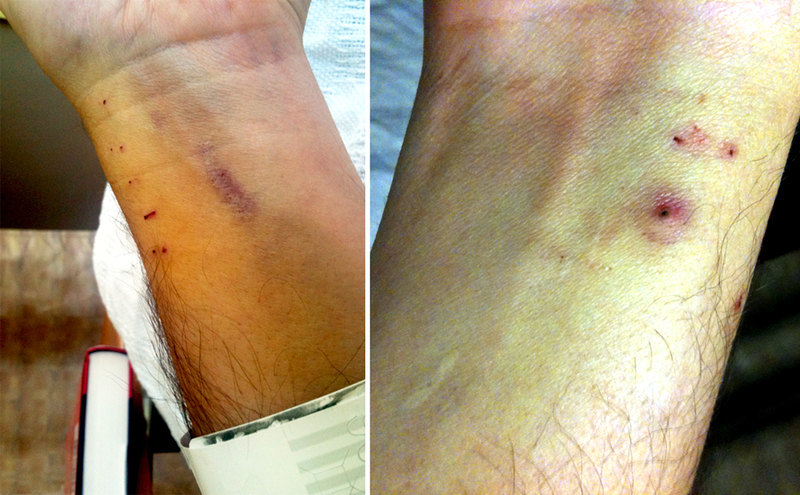 The neurologist thinks that the clot is permanent, and that I’ll be on blood thinners for the rest of my life. The neurologists are a bit more optimistic and believe that I’ll within 3-6 months it might resolve and I’ll be able to stop the coumadin therapy. The other specialists are mixed between them in their estimates for when – and if – I’ll be able to recover fully. For now, I’ll be taking it, hoping – praying – that the clot resolves itself so that I can get on with my life without the restrictions that coumadin poses. That I can get the PFO fixed to prevent another clot from reaching the same spot. That I’ll get over the post-traumatic stress disorder that makes every tinge of dizziness, every slight misspoken word, each slight pain or tickle makes me fear – sometimes just for a moment – that I’m having a re-occurrence. For now, I will be getting a series of tests to check my INR levels and make sure they stay at the right levels. I’ll be setting up appointments with neurologists, cardiologists and hematologists and having more tests run. I’ll be chomping at the bit until I’m allowed to work – for now, it’s only light work from home, part-time. And I’ll be cautiously living my life under the cloud of what could happen should something else go wrong. But I’ll be living, and living as full a life as I can given the restrictions I have. And I’ll be celebrating a second chance with everything I have. Wow. I’m glad you took the time to write this up. I can only imagine how frustrated you must be. To feel basically fine through most of this is really odd. I hope you are able to recover, and quickly. Take care. I’m glad you’re basically ok.
@Apertome – sorry, never got the notification you left a comment. It was indeed scary and I’m glad that things seem to be in the mend. Thanks for the well wishes.